"Firewheel" redirects here. For the Garland, Texas shopping center, see Firewheel Town Center. Wikimedia Commons has media related to Gaillardia pulchella. Gaillardia pulchella is a hardy plant, not picky about soil, though sandy and well-drained are best. It has a high drought tolerance and does best with a dry, hot climate in full sun. Its vibrantly colored flowers can be seen carpeting fields and the sides of highways for miles in the summer to late fall. Favored by honeybees, it produces a dark reddish amber buttery tasting honey. In the garden, the flowers can be deadheaded to promote further blooming. It self-seeds freely. 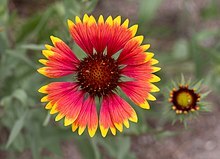 ^ The Plant List, Gaillardia pulchella Foug. ^ Gibbs Russell, G. E., W. G. M. Welman, E. Retief, K. L. Immelman, G. Germishuizen, B. J. Pienaar, M. Van Wyk & A. Nicholas. 1987. List of species of southern African plants. Memoirs of the Botanical Survey of South Africa 2(1–2): 1–152(pt. 1), 1–270(pt. 2). ^ "Gaillardia pulchella". Germplasm Resources Information Network (GRIN). Agricultural Research Service (ARS), United States Department of Agriculture (USDA). Retrieved 24 December 2017.